-Talk about an auspicious entree into 2013 - Pinnick Gales Pridgen have thrown down the gauntlet hard - the high-water mark for the new year is set, and set high. Make no bones about it, this is a supergroup, but there's nothing to fear, for these three musical titans seem to have checked their egos at the door, and simply gotten down to the business of making a great album. There's not a weak link to be found - the songs are thrilling, with incredibly fat grooves, sophisticated changes, some great poetry for lyrics, and an always solid melodic foundation; the playing is stupendous - you have three guys who are absolute state of the art in terms of chops, tones and taste; even the production is exemplary - there's massive amounts of information, but it's all delivered with a crisp clarity. PGP has it all in spades, and I won't be alone in hoping that this lineup takes it onto the road, and back into the studio. 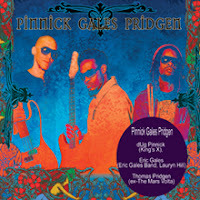 Pinnick Gales Pridgen CDs are Here!